It is hard to believe that asparagus done so easily in the oven turns out so perfect. The Parmesan adds just the right touch. This vegetable will go great beside grilled steaks, chops, chicken or fish; or you can cut it up to add it to your favorite pasta dish. 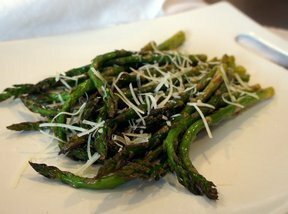 See step-by-step instructions on how to prepare fresh asparagus for cooking and adding to your favorite dish. Use our cooking guide to see how to grill asparagus. Here you will find tips on how to grill perfect asparagus every time.